The sequence containers from STL have these two functions for accessing the first or the last element of the container (or an analogue like std::priority_queue::top). They do not return iterator but a reference to the object in the vector. This is applicable in the simpler cases and there is no need to involve copy/move semantics. 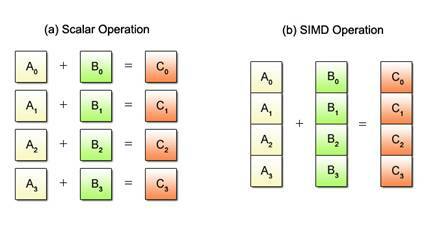 SIMD stands for Single Instruction Multiple Data. 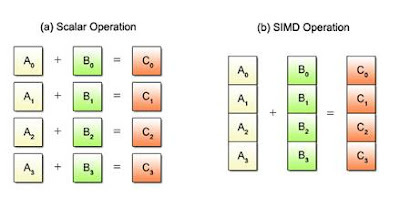 Hardware vendors found that in computationaly heavy tasks (especially multimedia) where a lot of independent from one another computations are done over small pieces of data (bytes or shorts for example) it is possible to pack the pieces into one instruction and evaluate it altogether instead of processing one byte per instruction while the rest of the space is left unused. This technique is also called vectorization. So far so good. The problem is that vectorization is not standardized so you have several options - use assembly (which may be different on different hardware), use compiler specifics, use a third party library (which may be tricky to get into production) or have faith in the compiler to auto-vectorize ( MSVC, gcc, clang). string_view is replacement of (char* str, int charCount...) that we usually see in C code. It is basically a pointer to the start of an array of chars (there are also wstring_view, etc) and a number (count) plus useful functionality. It is a non-owning(!) view of a sequence of chars. Extremely important thing to remember - string_vew is *not* null terminated. Avoid replacing const std::string& with string_vew where you've used std::string::c_str() to pass a null terminated string to some low level functions. std::basic_string::c_str() guarantees null terminated string, string_view does not. For more info check this article by Marco Arena or the string_view lecture by Marshall Clow from CppCon 2015. This is not about deleting special member functions (copy/move operations, destructor) but for using = delete; with normal functions (including member functions). we state that we forbid using this overload. And the deleted functions participate in overload resolution. if we try to invoke foo(10) we will get a compiler error. If void foo(int n) is just missing/not existing the overload with double will be called. I was short on time again. This blogging thing proves to be a little harder than expected. Not because I'm noob (I'm working on that, OK?) but mainly because it appeares that I'm much more disorganized than I expected. Finding time for writing and time for tip mining proves to be tricky. Keeping to tight schedule forces me to improve my efficiency and productivity. But surprisingly I'm not stressed out at all about any of this - discovering how much I don`t know, how much time I waste, how easy distracted I am, etc. Once I saw it clearly it became just another problem to solve. I really expected to be more panicked.